There are many ways to emphasize a note in a piece of music. Perhaps the word “moment” in a piece of music would be more clear. Moment, in a specific sense of a point in time or a beat or an off beat. In my last few posts we were reviewing shifting rhythmic patterns in works and there were some examples that had irregular time signatures. It’s reasonable to use these when a melody or rhythmic pattern needs to have five or seven or some other odd number of beats in a measure. But sometimes you simply need a single beat. One that’s not part of another measure or one that feels like it should be part of its neighboring measure. 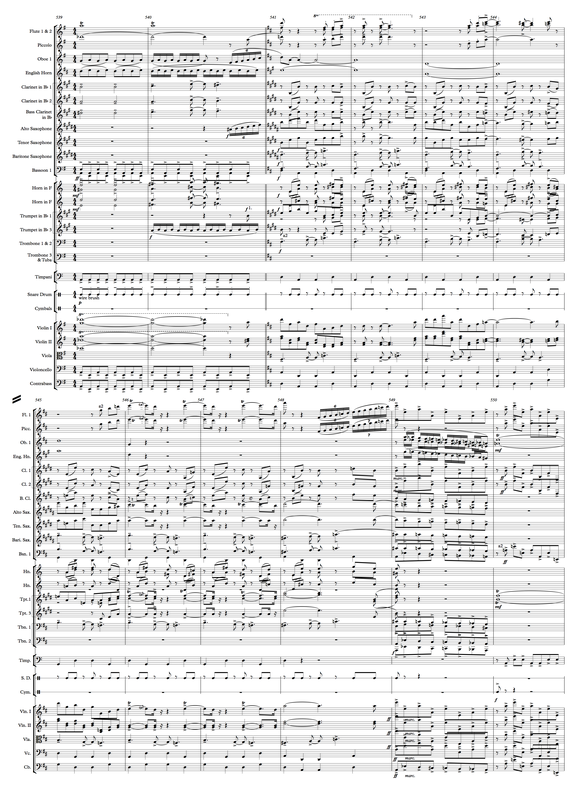 Listen to Example 61.1 and hear how the composer does this. The melody and rhythm for the first two measures are about as regular as you can get. It has the feel and tempo of a march. In fact, in the original performance, this music was played by a marching band on the stage. But after those two very regular measures, the composer decides to follow up with a single beat, hence, the measure of 1/4. The pattern repeats four times. Bernstein treats the one beat “theme” as a separate measure and not one tacked on to the previous measure by labeling it 5/4. Once he has finished with this 4 + 4 + 1 pattern, the music immediately moves to 7/8. The pattern is one of call and response between a children’s choir and an adult choir. Note how there are no rests in this entire passage. At the end of each bar there is a feeling that it would be OK if it were in 4/4/ and the final eighth note were instead a quarter note. Instead, Bernstein makes the passage his own and the result is a sense of anxiousness. It almost feels as though the passage is being rushed. Most listeners probably feel more comfortable when rhythms are regular. The key here in these few measures is that the composer goes directly from a feeling of extra time in the 1/4 measures to a feeling of a lack of time in the 7/8 section. It’s a creative way to keep the audience’s interest, even if they are unaware of the section’s intricacies. In my previous post (Post 60. Rhythmic Irregularities 2) we were looking at George Gershwin’s An American in Paris and some of the ways he chose to emphasize moments in certain passages, creating rhythms that were irregular. After the homesick blues section and some development, listen to the next section of the piece. Our strolling American has been able to shake his blues and is revitalized by the jazzy dance rhythms of this section. The first thing to note in Example 61.2 is the basic 4/4 rhythm provided by the bassoons, percussion and strings. The emphasis is on 1 and 3 in the second bassoon, the second section of cellos and the double bass. The accents on 2 and 4 are provided by the pizzicato chords in the second violins. The saxophones and violas add to the emphasis of the regular off beats, adding a minor second with leading and trailing eighth notes. The dissonance on 2 and 4 here adds to the mix to accent these beats. The melody, introduced in the trumpet, is mostly an arpeggio exercise jumping around the notes, first of the key’s tonic chord. Rhythmically, hear how the emphasis is on the downbeats of 1, 2 and 3. But then for the second measure the accents in the melody are on the preceding beats: the last eighth note of the first measure (bar 482) and the “and” of the first two downbeats of the next measure. To add extra support to all of these accented notes, the composer has each of them doubled by the second trumpet, which he has muted while the first trumpet is open. This device might be difficult to hear, but does help to accent these notes. As the melody continues the composer includes another shift in emphasis with the trilled notes in measures 487 and 488: Each trill snippet is three beats, so the stress is on beat one of measure 487, then again on beat four of that measure, and once more on beat three of the ensuing one. This is a now familiar pattern in the Gershwin we’ve been examining. Soon we’ll hear a similar example from the other twentieth century icon with whom we began. Orchestrationally, it’s noteworthy to hear how, as the trumpet tune is venturing rather low, Gershwin supports it with the oboe at the end of measure 486. The trills themselves are also played by more winds (clarinets and horns). And, speaking of what to do when your trumpet melody gets too low, hear how the composer moves it from the trumpet to the trombone beginning in the second half of measure 490. The hand-off is accomplished quite smoothly by the trumpets and trombones hitting the same note on the third beat of the measure. Here too, as he did with the trumpet solo, he brings in the second player in the section to support the accented notes. 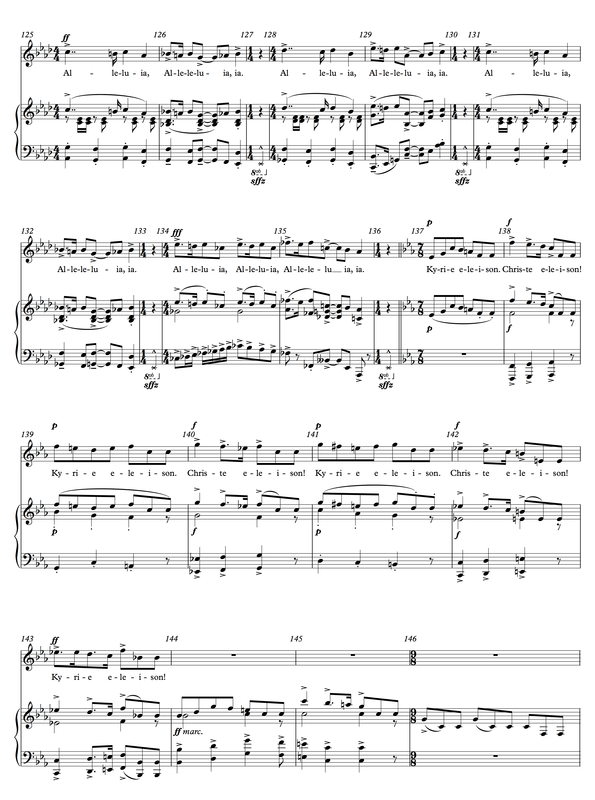 From the point of view of the arrangement, note how Gershwin uses this melody to fill the first of the two final measures of the phrase just prior to the staccato lines. This is played in a relatively infrequent arrangement by a set of high instruments (the piccolo, flutes, English horn) and low ones (lower strings). The combined effect is short, small piece of brilliance. 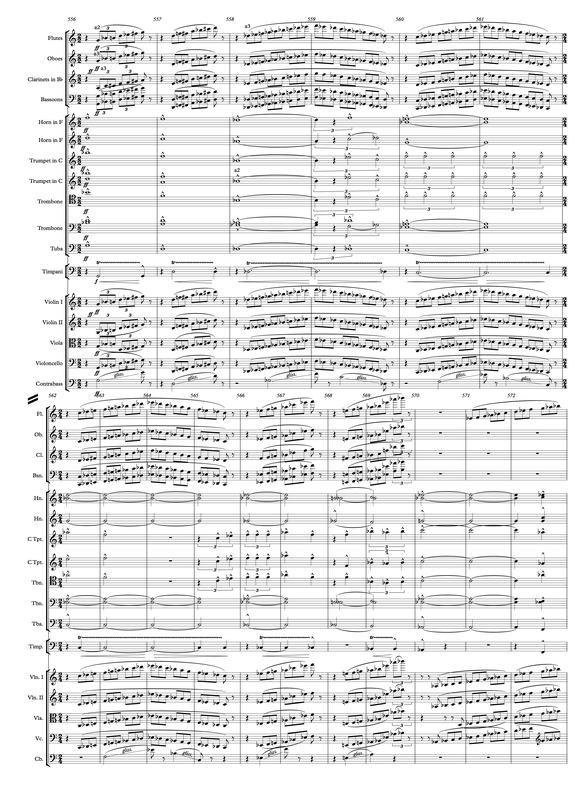 After a bit of development, the composer brings back this tune with the full orchestra at measure 541. Listen to Example 61.3 first for the melody, this time played by the upper two saxophones, the trumpet and the first violins, harmonized in the seconds. Previously, the composer brought in some additional resources for the emphasized melody notes. This task is now assigned to the upper woodwinds and trumpets. Probably the most emphasized aspect to this passage is the strong trombone rhythm, also played by (but barely noticed in) the baritone sax, one bassoon, and violas. Before moving on to the next example, one that personifies the “rhythmic irregularity” moniker, there’s one more item that deserves notice here. It’s the other half, if you will, of the trombone part. It’s difficult to hear so you may have to refer to the score. 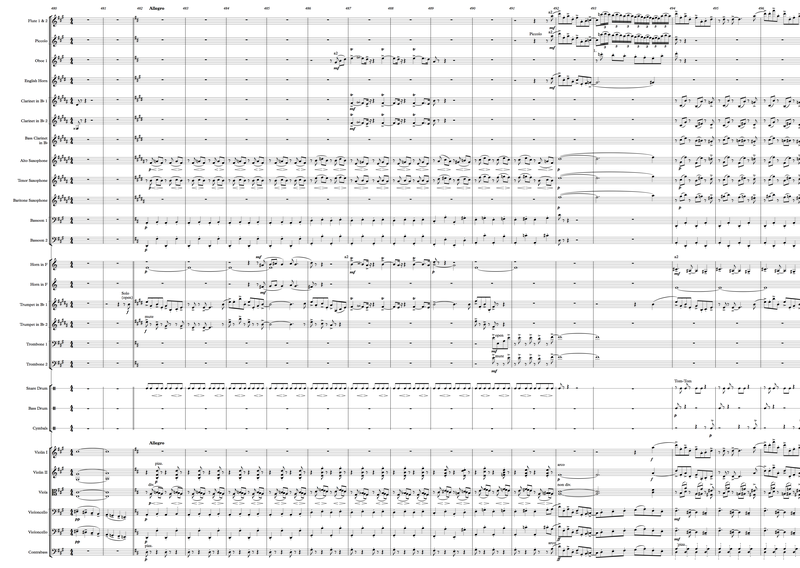 Note how the clarinets and horns answer the notes in the trombone line. This group of clarinets and horns do not play on the one, the and of two or the and of three. However, they do play all the other eighth notes in the measure. In this arrangement, there is an eighth note played throughout each measure. This serves to maintain the steady pulse of eighth notes, but with the enhanced accents in the trombones. In fact, Gershwin uses this “answering” function in a further example. Before examining the next An American in Paris passage, I want to return to the subject of beats and their anticipation. Near the opening of Leonard Bernstein’s brilliant overture to Candide, after the initial fanfare, the composer begins a duple passage that’s just a little off. In Example 61.4, right after the descending quarter note scale from F to B-flat, the predominant horns enter in thirds on the first three quarter notes of the measure. But, we’re thrown off by the accented entry on the fourth quarter note in the low instruments. This pattern continues for a few measures while our brain is trying to decide exactly where the beat is. Once the rapid melody begins at measure 10, our sense of rhythm appears to have returned. But just a few bars later, Bernstein throws the equilibrium off again. Recall the trilled bars in the previous Gershwin example, measures 546 and 547. The phrase is three beats long. It begins on the down beat of 546, then on the fourth beat of the same bar, and again on the third beat of the next. Here, in the Candide Overture we have the same type of accents in measures 14 and 15. The tune emphasizes the high F on the down beat of 14, the fourth quarter beat of 14 and on the third of 15. To keep us guessing about the exact placement of the beat, the composer shifts the bass line and the accompanying chords so the it now works in with these syncopated accents in the melody. 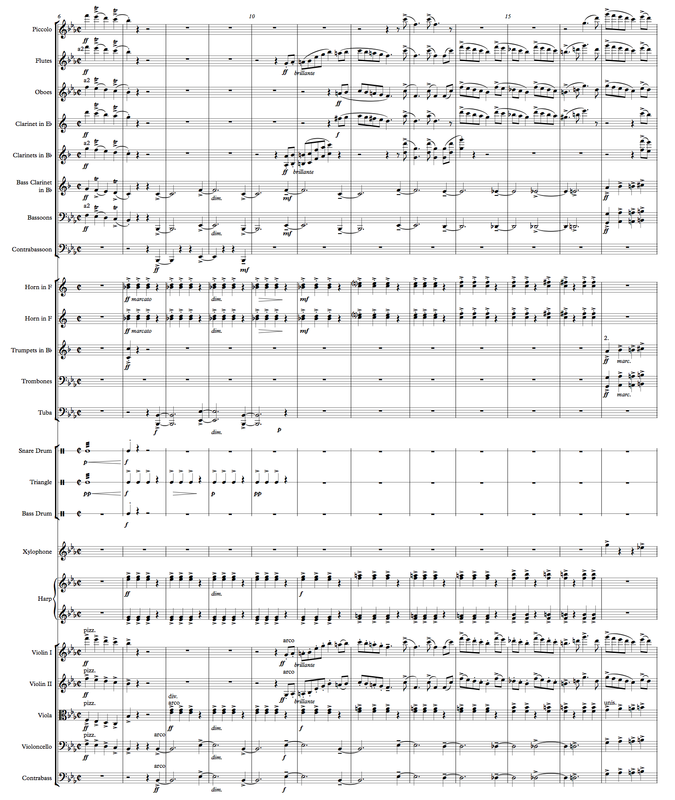 In these playful passages both composers have written the syncopation for the music into the entire ensemble. A brief example from Bartók’s Concerto for Orchestra’s final movement also shows how a listener can get a little confused with the rhythms, but still it makes dramatic sense. With the beginning of the melody played in regular rhythmic patterns on the down beats of each measure, the listener can be lulled into a false sense of regularity. But here Bartók uses a simple half note triplet pattern to destroy our expectations. To further addle our brains, the ascending and descending scales from the woodwinds and strings have a regular pattern that aids in the composer’s deception. The beat and the bar lines confuse the ear in this brief passage. It was a technique the composer used successfully in his canon. Returning to An American in Paris, not too much further from where we left our American wanderer, towards the end of the work, Gershwin gives us something quite special. Leading into this Grandioso reintroduction of the homesick blues melody are sets of three eighth beats (two notes and a rest). The orchestra slows down to bring greater weight to the climactic restatement. The crescendo in the timpani adds to this impending eclat. And when we get to the melody at measure 564 it is played by the first trumpet and in three octaves in all the strings, save the double basses. In just looking at the score, it might be easy to think this is overkill. Yet, the busy-ness in the rest of the orchestra balances the melody. In the bass clarinet, bassoons, subordinate trumpets, trombones, percussion and double basses, we return to this pattern of two eighth notes and one eighth rest. Here, though, the composer has enough other forces emphasizing the downbeat of the first measure that he starts the pattern with an eighth rest. This is followed by two eighth note chords with accents on the second of each pair. The percussion assists in this secondary rhythm with a snare drum eighth note roll followed by a single staccato note, accented with a stopped cymbal hit. For the second pair the snare drum repeats its pattern, but this time the bass drum accents the second note. For the third pair, Gershwin only has two eighth notes from the timpani. Note that the part is marked “Hit in the middle (no tonality).” This is one of those things that most percussionists know, but is not widely known outside of this idiosyncratic section of the orchestra. The two notes played on a smaller and larger drum will have a higher and lower sound, they simply will not be on a specific pitch. Once the timpani finishes on the down beat of the second bar (measure 565), the pattern begins anew with a rest, followed by the snare drum roll. As I stated, the downbeat of the first measure of this section has the requisite inherent strength with the first trumpet and all those strings. But the melody sustains for a whole note and the counter-rhythm is strong. Gershwin wants to help us know where the beat should be, though, so he gives us the four horns in unison playing half notes, showing clearly where 1 and 3 are in each melody. As supportive as this is in function, it also serves to show how the counter-rhythm rubs against it. I suggest listening again, focusing just on the rhythms of the passage. Finally, we have one line that has not been mentioned: the runs in the upper woodwinds. If you can focus on when they hit their eighth notes (at the end of each scalar pattern) and then begin a new run, you can hear how it often works with and supports the counter-rhythm. This passage in An American in Paris is a good example of Gershwin’s use of polyrhythm. At its core is the blue melody previously introduced when the American stroller was homesick. Now that melody, even though played by a trumpet and some forty or fifty strings is swallowed up by the contrary – and supporting – rhythms and flourishes of the rest of the orchestra. When we finally get to what could be referred to as the middle section of the blues tune, the conflicting forces cease as suddenly as they began on the down beat of measure 572. The percussion drops out and we are left with just two elements: (1) the melody (with some internal harmonization) in the upper winds and upper strings and (2) the counter melody in the bassoons, lower brass and lower strings. Even at this logical ending to this phrase, the composer tosses in two additional elements of interest. 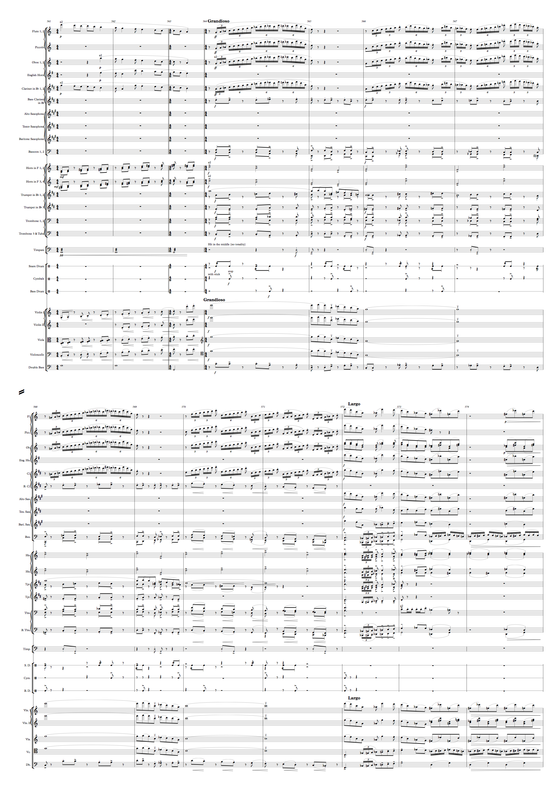 For one, the taxi melody is played at the beginning of measure 573 by two trombones. The other is the scalar chromatic line moving up and down in a tritone from E-flat to A. Both of the parts enhance the “But wait, there’s more!” functionality. We are reminded of the chaos of the early busy street by the trombone part and we are immediately given a feeling of harmonic uncertainty by the chromatic line and the similar disjointed melody. I hope you’ve enjoyed this post. When we began to examine Gershwin’s orchestral works I mentioned that he had the rare ability to straddle the two worlds of popular music and classical music. We see this extraordinary talent again in Leonard Bernstein, a man who could have “just” been a world class conductor, composer of both popular and orchestral music, pianist, or teacher. Yet, he chose to do them all. Next time we’ll examine a little more Gershwin and a bit more Bernstein, too.